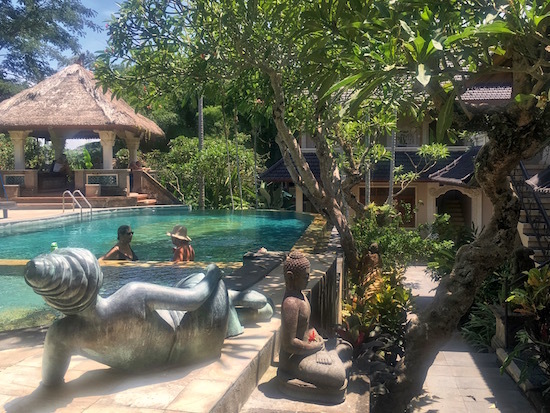 Honeymoon Guesthouse is an Ubud institution that still ticks all the boxes, offering classically Balinese accommodation in a serene setting, plus a pool, spa and yoga classes. When you enter the compound, you know you’re in Bali. Stone carvings and ornate woodwork abound in the well-kept tropical garden. The long-running, popular hotel has a variety of fan-cooled and air-con rooms, all tastefully decorated. 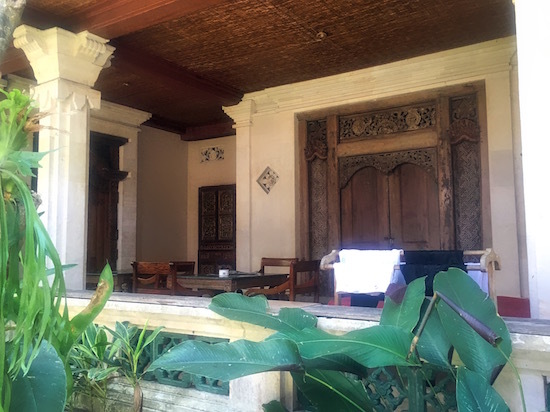 The guesthouse is owned by Ketut Suardana and his Australian wife, Janet de Neefe of Ubud Writers Festival fame. They also run a string of popular restaurants and a cooking school. 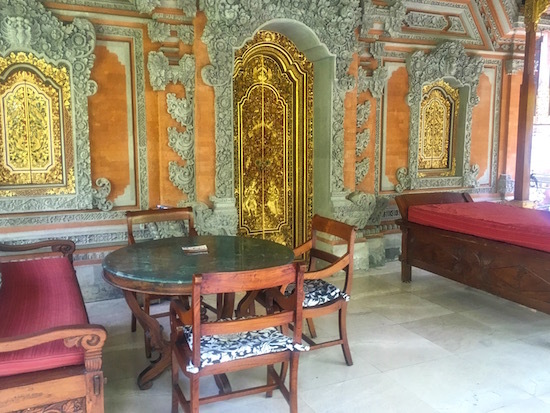 The ornate Bisma bungalows are designed as Balinese open pavilions. 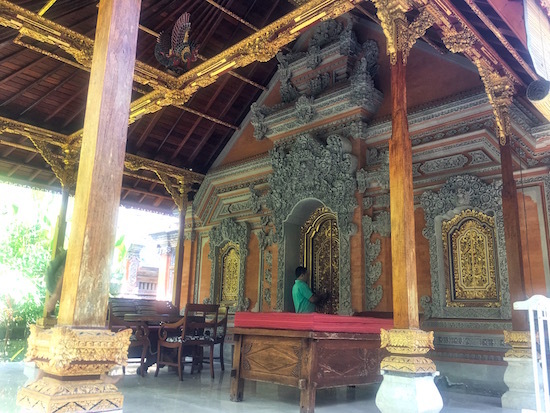 Gilt carved wooden doors and shutters are edged with elaborate stone carving, while the high traditional thatch roof has exposed beams with more decorative craftsmanship. It’s all very grand and palatial. The interior of the huge, marble-tiled rooms are cool and comfortable, if a little dark — some may say very dark, as you would need a lamp for reading during the day. 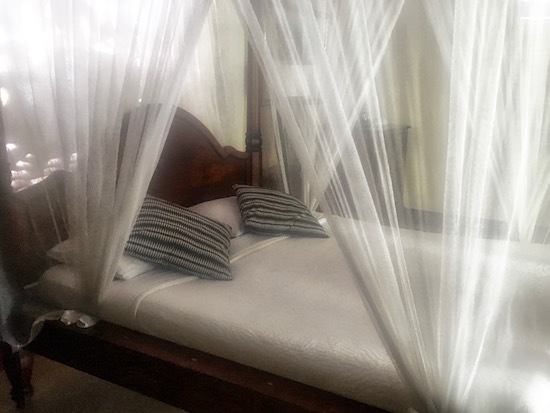 Carved teak four-poster beds sport crisp white sheets and mosquito net canopies. A teak cabinet hides the minibar, and coffee and tea-making facilities are provided. Tasteful artwork and lamps enhance the finish. Rooms are plenty large enough for an extra bed or two if needed. The wooden-shuttered glassless windows are designed to be open to the cooling breeze. Complaints have been made of critters in rooms, but Balinese architecture is designed for inviting the outdoors in. Geckos and ants are to be expected in the tropics — if they freak you out, an enclosed air-con room may be a better choice. Hot-water marble bathrooms are super clean and styled with all the trimmings you’d expect in this price range. What truly appeals is the large outdoor living areas of the bungalow rooms. Furnished with comfortable cushioned teak lounges, they are a perfect spot for catching up on those holiday novels. Other rooms at Honeymoon Guesthouse come with outdoor living spaces, but none as large as the Bisma rooms. Spread around the garden, amid frangipani trees, some rooms are set close to the pool, while others have impressive views of Gunung Agung. Family rooms feature enclosed balconies for keeping wandering toddlers confined. Rooms continue in an extension across the road, all with the same elegant style. The shady pool is lovely, again decorated with an eye for classic detail. Join the statue of a reclining bronze lady on a nearby lounge, or jump in – it’s large enough for a short lap, with a separate shallow area for kids. Included breakfast is served in the restaurant or in your room for an additional charge. A free shuttle drops guests at Casa Luna and Indus restaurants where guests receive loyalty discounts. Room service comes from Casa Luna. Honeymoon Guesthouse caters for yoga types, with a yoga studio that offers a blend of Hatha and Vinayasa taught by Balinese teachers, while guests can be pampered at an in-house spa. Retreat packages including accommodation, yoga and cooking classes and spa treatments are available. Occupancy rates at Honeymoon Guesthouse are consistently high — bookings are recommended, and essential during festival time. If Honeymoon Guesthouse is full or if you have a tighter budget, nearby Sama’s Cottages www.samascottagesubud.weebly.com have lovely clean and cosy Balinese-style bungalows in around the same price bracket.